The weather finally became what I want from weather: gloriously warm and sunny. Friday I celebrated by going for a run. Conventional wisdom for a while now has been that faster foot-turnover—at a rate of 180 steps per minute—is better. Supposedly it maximizes the amount of energy stored in the elastic properties of your feet and ankles which can then be returned as free energy in the next stride. Slower foot-turnover means you have to work harder twice—first, using muscle strength to absorb the energy of the foot-strike, and then using fresh muscle power to generate the next stride. To work on that, I’d downloaded a metronome app to my phone, and set it to tick at 180 bpm. I started that up, and started running in sync with the ticking. I’m sure it’s possible to run at a slow pace with fast foot-turnover, but doing so did not come naturally to me. I sprinted off down the road at quite a bit faster than my usual running pace. With my attention focused on faster, lighter foot-strikes, I managed to get myself pretty out of breath in just a mile or so. At around 2 miles, I passed a playground that I like to pause at—I practice my balancing by running around the perimeter formed by (I think) 1×6 boards, and then do some inverted rows using a piece of playground equipment. That gave me a chance to catch my breath a little, and I walked for a minute or so after I finished there. Once I started up running again, I ran a bit more slowly. I’d turned off the metronome, although I was trying to keep the 180 bpm pace in my head. I was doing a bit better at keeping a lower pace, until I came into sight of the traffic light to cross Route 45, and saw that Jackie was also approaching the intersection, about a block ahead of me. I responded to that by picking up the pace (again), and managed to cross on the same walk signal. Then I quit running, and walked the rest of the way home with her. The run came in a 3.2 miles, at an average pace that is nothing to write home about, except that it includes the time playing on the playground equipment. Next step: Figure out how to run slowly with fast foot-turnover. 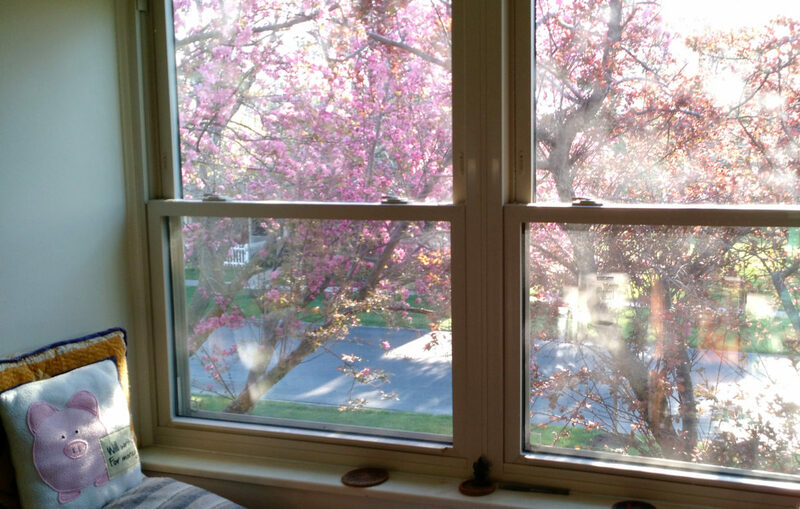 The image at the top is the view out the study window, where you can see that our neighbor’s flowering tree is in full bloom. Ours is perhaps a day or two behind.